On May 1st, I left my outside of the house job and became a full time work from home Blogger and Community Manager. If you’ve ever read any of my previous income reports, then you know that I joined Billionaire Blog Club last year and that it has completely changed the way I blog and therefore the amount of money I make from the blog. The community I’ve found there has been life changing, quite literally, and I somehow weaseled my way into a job with BBC. Weaseled my way sounds wrong. Basically, I found something that I LOVE to do: Helping people get the answers to the blogging questions that plague them. I don’t have anywhere near all the answers, but I know the BBC curriculum really well and I know the strengths of our members. So when I don’t have an answer, I usually know who does. As the community has grown, Scrivs, the blogger behind BBC, decided to hire me to manage it. I’m sure you haven’t landed here because you wanted to know about how to blog; you’re probably here for the Pencil Holders. Sorry for the digression! There are some Pencil Holders down below, I promise. But, one last thing about Billionaire Blog Club. If you have ever thought about starting a blog, you should not ever do it without some support. I tried it for 4.5 years and quit several times and never made any money. 4 months after joining BBC, I was earning enough money from ads and affiliate sales to actually cover the cost of the blog and put some in my bank account. 8 months after joining BBC, my blog and my gig as Community Manager have made it possible for me to work from home. And, ps, working from home on your own thing where you’re basically your own boss, is a whole other post in and of itself. When I figure out what the hell I’m doing, I’ll write about it. But as of right now, I have no routine, no organization, no dedicated workspace. I’m a bit of a disaster, to be honest. I’ll figure it out though, I’m sure. Ok, Pencil Holders though right?? 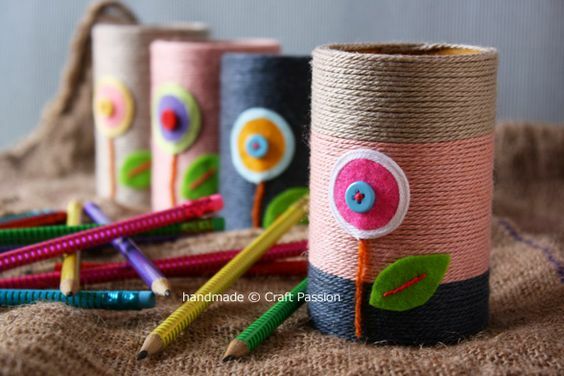 DIY Pencil Holders for My Work From Home Desk! 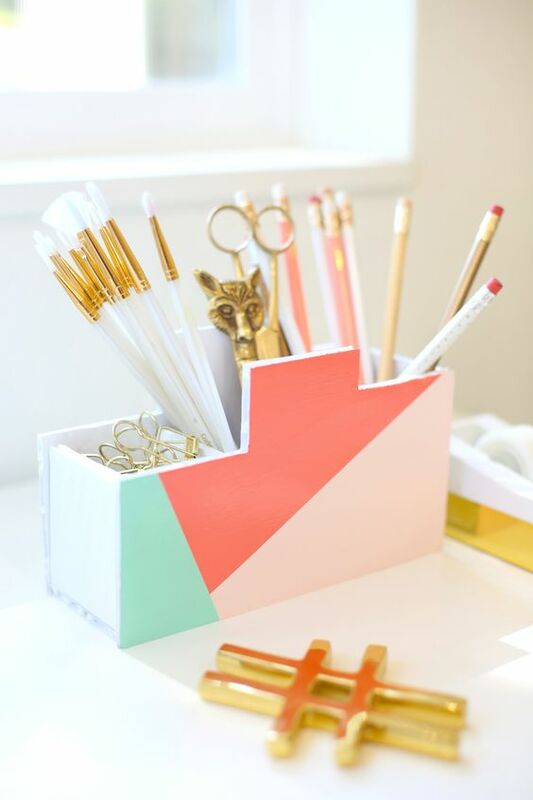 When I first looked at this pretty pencil holder/desk organizer, I though, mmmm, nope, that looks like power tools were involved and I’m not about to get into that just for a pencil holder. But guess what? I was WRONG! That’s foam core board and you don’t need any power tools, just a craft knife! So while there is still a risk of cutting myself, there is less risk of cutting off a finger. Which now means I might actually try this. Maybe. What I have in my head is an actual desktop pencil holder, but this DIY Pencil Case from Mermaid’s Den is pretty and portable! I like the idea of being able to grab this little bag and bring it to whatever flat surface in my house I happen to be working on. It gives me flexibility. However, as I’ve noted about my disorganization, perhaps flexibility is not really something I need right at this moment. I think structure is probably a higher priority for me right now. 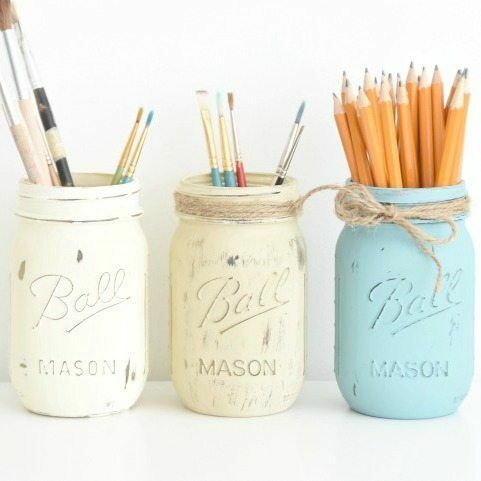 I like the idea of using something like a Mason Jar for a pencil holder. They are heavy and sturdy, so I’ll be less likely to knock them over. I also have a cat who has a compulsion for knocking this over. Like, he CANNOT stand for a water bottle to be UPRIGHT on a table! He just WON’T have it! It’s his mission in life to knock over all the water bottles. Or any other upright vessel that is on a flat surface. But the mason jars are tough, I don’t think he could knock them over without thumbs. 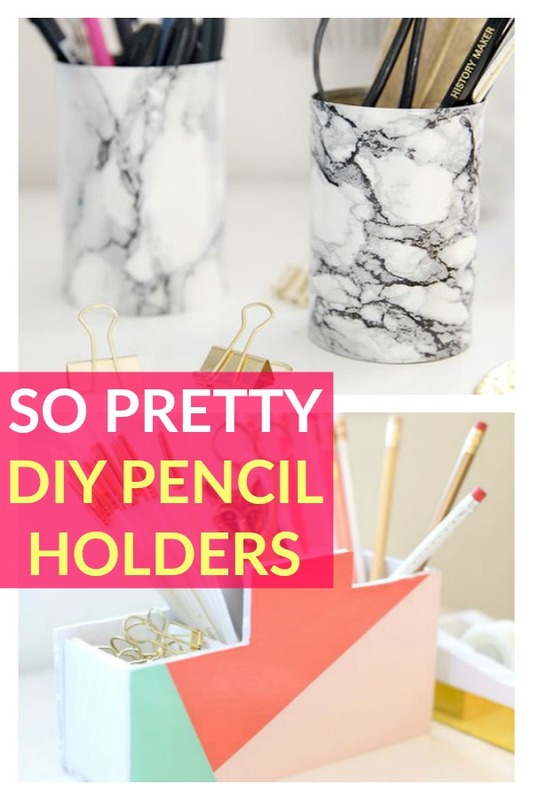 These pretty DIY Duct Pencil Holders are probably my favorite. I love the colors, but depending on what you choose for duct tape options, the options are only limited by your imagination. Which is sometimes a problem for me, because my imagination sometimes likes ugly color combinations. But, this is probably the one that I will end up trying myself. I mean, how bad can I mess up duct tape, right? If I don’t like it, I rip it off and start over. 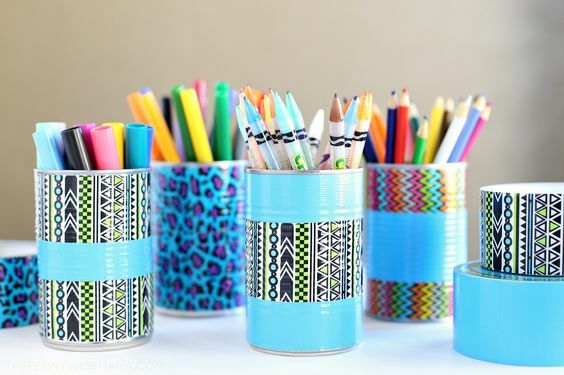 I love that this is an upcyle of tin cans, too. Super cheap. 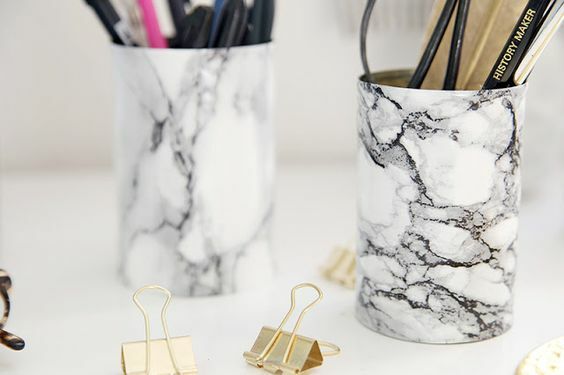 This is a similar upcycle to the previous, but these DIY Marble Pencil Holders are made with contact paper instead of duct tape. I LOVE working with contact paper. It’s super versatile and easy to work with. This marbled contact paper is reminding me of the time in college I contact papered our old formica countertops. Because even in college I knew I liked marble. 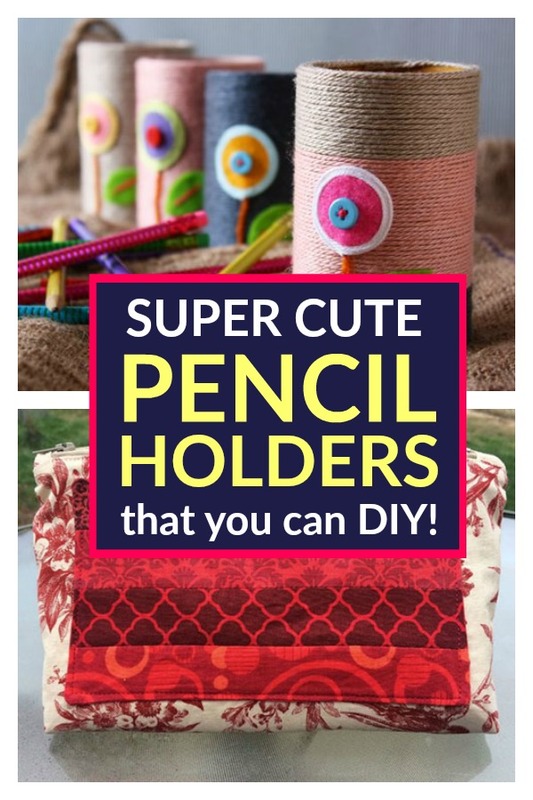 This is by far the cutest DIY Pencil holder on this list. I love that it’s made with a paper tube (like a leftover one from, say wrapping paper, or something). Such a great way to recycle something that would otherwise just be waste. And if you are a crafter, you probably have the rest of these materials in your craft drawer. Or craft cabinet. Or craft room. Or, scattered in all of the above throughout your entire house. 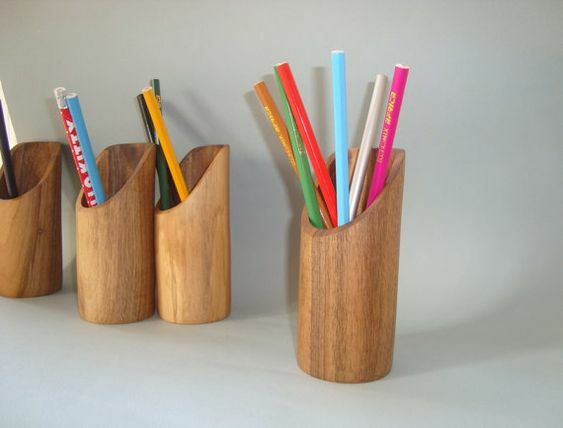 Now, maybe, as a busy work at home blogging mogul, I might not have time to DIY a pencil holder. If that’s the case, I still would want a special pencil holder. Not an ordinary plastic one that you can buy at Target. (Not that I don’t love Target!). So, I did a little looking on Etsy for some options, too! Now, this, is a special pencil holder. Forged out of a piece of onyx. And if I go buy it right now, it will be gone forever. Well, it will be in my house, not gone, but gone for anyone else who might want to buy it because it’s vintage and there’s only one available. So, that’s kind of cool. I like the simplicity of this. I like that the pencils are the star of the show. I should say, at this point, I’m not probably going to have pencils in my pencil holder. I’m going to have pens. Namely, the DIY Marbled Pens I just made. I didn’t want to mislead you into thinking I was all about pencils and then show you a photo someday of my pencil holder with pens in it. Just so we’re clear. I love the look of concrete. I tried making something out of concrete once. It didn’t work out well. My friend Laura from Little Yellow Wheel Barrow, however, told me about shapeable concrete. She made these lovely DIY Concrete Herb Pots and she has convinced me to try again. Maybe. 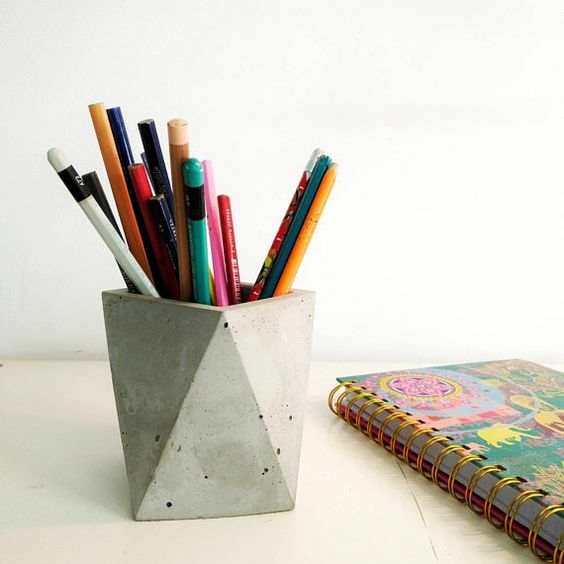 Or maybe I’ll just buy this concrete pencil holder to satisfy my concrete craving. 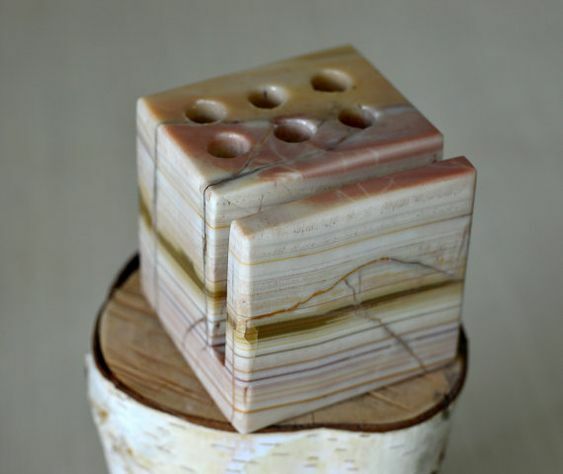 Do you think that if I make or buy a new Pencil Holder it will be like a stepping stone to getting organized? Does it work like that? Here’s hoping it works exactly like that!